Rob and his staff have developed an intense and positive learning environment. His skills and camps are not only educational but an enjoyable experience -- something that can’t be stressed enough in youth hockey. RB Hockey breaks down the player and focuses on the individual instead of the group as a whole. By doing this, he is able to expose their weaknesses and give them the confidence and ability they need to get better and excel. It is our goal to give each player the knowledge, confidence and ability to utilize the skills we teach and to bring these skills to the game of hockey. Each day, players will be driven to their full capability. Instructors will demonstrate drills for specific skill development and coach each player to insure the drills are done correctly. First at half speed and then at full speed, because we believe players play the way they practice. At camp, we focus on the technique, speed, quickness and agility of each player to maximize individual potential and development. 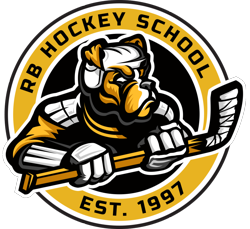 Coaches at RB Hockey are vastly experienced, superbly trained, and extensively schooled in the ideologies and methodologies that we believe in and support. Before instructing any players, every instructor must skate through the same series of drills that their players will be asked to do. Every one of our coaches embodies a unique style and approach, but by bringing them together and communicating our message, we are accomplishing the same goal -- Player development and enjoyment in the game of hockey. Your confidence in our school is appreciated and it is our promise to you for 100% satisfaction when your player hits the ice. ©2019 RB Hockey / SportsEngine. All Rights Reserved.